Any attempt to herd these strong-willed Rolfers into a cohesive, highly functioning unit has traditionally been rather challenging, but this year proved different. 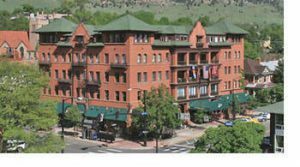 The three-day convention at the historic Boulderado HOTEL was filled with activities that exuded heartfelt devotion, energetic unity and a sense of “we” — a synergy sorely missed by some in years past. It was obvious from the first day of the packed convention that these passionate and dynamic therapists weren’t there to squabble or complain, but to raise the somatic education bar via groundbreaking fascial research programs and extraordinary hands-on seminars. The highlight of the event was the keynote address, titled “From Fish to Man: The Story of the Human Spine,” stunningly delivered by renowned Canadian researcher Serge Gracovetsky, PhD. The following day featured a host of inspired presentations and workshops, many conducted by some of the first teachers Dr. Rolf hand-selected nearly 40 years ago. 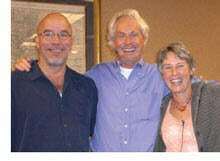 Jan Sultan and Michael Salveson lectured on the essence of Rolfing and the power of Rolf’s original vision, followed by breakout sessions scattered throughout the next two days. It had been 21 years since I last attended an annual conference. The rationale for my giving up a weekend of teaching to participate in this event was determined by four factors: to eagerly reconnect with old friends; to celebrate the formation of the Ida P. Rolf Research Foundation; to share in the new developments GENERATED by the tremendously successful Harvard Fascial Congress; and to help assist and pick the brain of the foremost biomechanical gait researcher of our time, Dr. Serge Gracovetsky. Therapists familiar with my “Don’t Get Married” articles are keenly aware of Gracovetsky’s influence on my approach for correcting inefficient movement patterns. 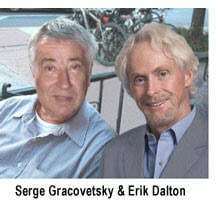 A background side note: Gracovetsky and I first met at a 1987 Rolf Institute Convention, where he also honored us with a keynote address. We reconnected again last October at the Harvard Fascial Congress (co-sponsored by the Rolf Institute), when he was awarded “Best Presentation” for his impressive spinal engine theory of human locomotion. Two decades later, I’m still clumsily attempting to translate his elaborate spinal biomechanics concepts into my clinical practice. I could blabber forever about his 27-year career as the head of Concordia University’s physics department in Montreal, his 34-year association with the late great biomedical researcher Harry Farfan (the co-founders of the prestigious International Society for the Study of the Lumbar Spine), and his astounding 2,000 research publications and presentations – in three languages. I asked myself: Where in this guy’s illustrious career does one stop? No easy answer comes to mind. Inevitably, Gracovetsky’s future accomplishments will only magnify as his massive body of work continues to infiltrate the world of structural integration and pain management. Sometimes, the best way to understand a man is to know the man, so I’ll briefly share one priceless encounter that occurred at the convention. When the news became public that Serge Gracovetsky would be speaking again at my old alma mater, I immediately contacted my best friend and mentor, Jim Asher. 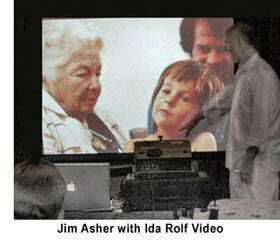 As one of the first instructors hand-picked by Ida Rolf, Jim worked tirelessly by her side until her death. With karma apparently at the helm, it was eerie Jim had already made plans for us to spend quality time with Serge during the upcoming convention. He had arranged an early pickup at the Denver airport to allow 45 minutes to drill Serge before arriving at the HOTEL, where adoring fans would most certainly consume all his attention. Little did we know we’d be gleefully glued to his hip for the next three days – a treat of a lifetime. The minute we spotted Serge, it was obvious he wasn’t suffering jet lag from the flight. His big blue eyes, mischievous grin, and frazzled hair exuded an energetic air of intellectual eccentricity. Since our previous encounters had been limited to formal convention settings and SHORT technical telephone and e-mail conversations, I was primarily acquainted with Serge’s intellectual side. By the time we’d exited the airport, Jim and I were fully captivated by his warm French-Canadian humor, witty unending dialogue and dogmatic nature. Definitely not the stereotypical researcher, Gracovetsky revealed that his passion for playing clarinet in the Montreal Symphony always preceded his love of the lab. As an indomitable twist of fate, the pre-convention workshops and Rolf faculty meetings left Serge virtually alone with Jim and me. It was obvious that he was accustomed to roadies and confidants, and we were delighted to fill those roles. Like most experienced presenters, his first request was to visit the convention hall where he was scheduled to speak that night, so he could inspect the hotel’s audiovisual setup. HOTEL management informed us the ballroom was in use until 4 p.m., so we decided to explore the outdoor Pearl Street Mall, eat sushi and run errands. We strolled the Boulder streets for hours, soaking up the lovely midday sun and relishing in a hodgepodge of nonstop conversations ranging from body biomechanics to Buddhism. What a thrill! Dr. Gracovetsky’s keynote was at 7 p.m., with a “meet-and-greet” Rolf function beginning at 5 p.m. Although the audiovisual set-up proved a bigger challenge than anticipated, we finished just in time to clean up and meet in the spacious lounge area just outside the convention hall, where entertainment, food and drinks were already in progress. It was a delightful experience meeting all the Rolf newbies and reconnecting with old friends. When the lights finally dimmed and the ballroom filled, Serge was politely introduced and away he went. Beginning with a flamboyant and humorous intro, he immediately captivated the crowd and humbly challenged them to think outside the biomedical box. His two-hour riveting presentation brought down the house. TOPPING the lovely evening was an impromptu gathering of Rolf elders, educators and friends packed tightly into three big tables in the patio area. An electrifying atmosphere of shop talk, laughter and fine French wine was enhanced by the full moon and the crisp Colorado mountain air. Saturday night’s well-organized festivities offered a welcome respite from two 10-hour days of educational drama and information overload, like 30 people packed into a Mini Cooper. What better way to help these kindred spirits unwind than to resurrect a surprise revival of an old Rolf tradition dating back to the early ’70s – an acoustic jam session consisting of hand drums, GUITARS and wind instruments, all accompanied by melodious singing and the oldest body-movement therapy in the world, dancing. Adding to this magnificent ambiance of unity and nostalgia was the organizing committee’s decision to hold the party at the original Rolf Institute building. Some who graduated from that small house on Pearl Street expressed ambivalence about revisiting a place that contained such strong emotional overtones. Indeed, a barrage of memories immediately filled the air as we entered the legendary Rolf “boot camp” training center. As Jim Asher, Jan Sultan and I wandered into the half-darkened, party-decorated, main teaching room, with Serge Gracovetsky tagging behind, it felt as if we’d been thrown into some sort of time warp. The fact that the building’s physical appearance seemed untouched heightened our awareness. Fortunately, our early arrival allowed time to reminisce without interruption. As we began collectively retrieving old visual panoramas of people walking “the line” while Rolf students and faculty astutely assessed their structure, Sultan half-jokingly remarked, “If only these walls could talk.” Asher fondly recalled how the cold days often required continual stoking of the big old pot-bellied stove to keep our models warm and moving. But my flashbacks focused on vivid memories of long, arduous and mentally exhausting days often extending into intense late-evening group therapy sessions filled with tears and laughter from emotional and physical fatigue. Although it seemed like hours had passed, we probably regained consciousness and returned to Mother Earth in only a few minutes. Daydreaming was suddenly replaced with goofy laughter, particularly when we glanced around and saw the expression on Serge Gracovetsky’s face. He was puzzled. It was apparent that he was trying to figure out what planet we’d been visiting and how the “people parading around in UNDERWEAR” ritual correlated with higher education. Tonight, however, was the time for festivities, and once Serge unpacked his clarinet and the jamming finally began, he felt right at home as wall-to-wall dancers shook the historic home. Rolfers definitely know how to have fun, and the 1960s atmosphere once again overflowed with love and laughter. 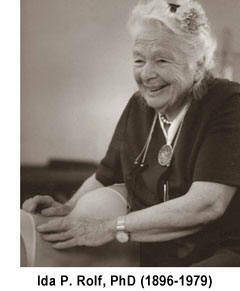 The embodiment of Ida Rolf’s 52 years of work has infiltrated every branch of manual therapy. Her unfaltering dream of a permanent elite school of hand-picked students eventually led to this house on Pearl Street. So much has evolved since her death, as training facilities continue to sprout up around the globe and her wisdom has seeded a new GENERATION of manual therapies. Seeing the full bloom of her life’s work and dedication was humbling and reminded me how lucky I am to be a soldier in such an army of wisdom-seekers bound to a time-honored tradition of excellence.